Democratic Schools is a film for those who are not already experts in the politics of education. It is a film that tries to show, as factually and objectively as possible, what unites these schools that assemble once a year under the visionary banner of democracy. 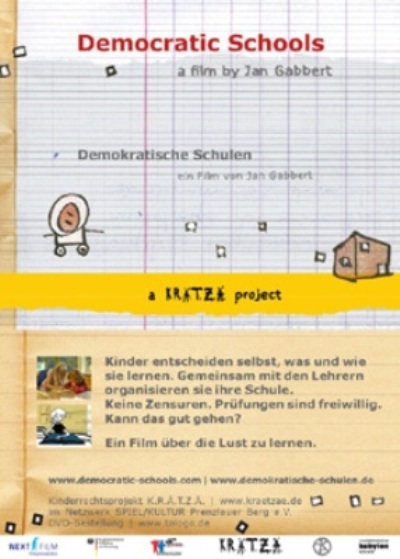 The interviews in this film took place at the 2005 International Democratic Education Conference (IDEC) in Berlin. There have been IDECs every year since 1993, dedicated to schools which are organised in a totally democratic way, schools where the students decide individually what, when, how and with whom they will learn, and joint decisions are made on the principle of “one person, one vote. There are already schools like this in many different countries, and most of them are very successful. In the film people from various democratic schools talk about their experiences and express their opinions.